A source at Porsche Design tells us that the company is looking to open in Calgary's Chinook Centre, ideally close to the mall's new Nordstrom store which is scheduled to open in the fall of 2014. The source wasn't sure if Porsche Design has already signed a lease in the mall. Porsche Design's Sherway Gardens pop-up store, which opened a few days ago, will remain open for only about two months. A company representative says that Porsche Design is hoping to secure a permanent retail presence in the mall by the end of 2014. Another possible Toronto store location could be at the Yorkdale Shopping Centre. A source tells us that Porsche Design might look to take over the 1,365 square foot retail space currently occupied by ICON Shoes, as ICON's lease expires in 2014. The space is located across from the mall's expanding Holt Renfrew store and is within close proximity to upscale stores such as Mulberry, Tiffany & Co., Cartier, Salvator Ferragamo, David Yurman and others. An Edmonton store is a possibility for Porsche Design, and we were informed that West Edmonton Mall would be the most likely location. Our source wasn't able to provide any further information as to when this could happen or its location within the mall. Ottawa and Montreal have both been mentioned as possible locations for Porsche Design stores, though we have few details besides Ottawa's Rideau Centre being the likely candidate for an Ottawa store location. Porsche Design already has two Canadian store locations: one on Toronto's Bloor Street and another which opened last week in Downtown Vancouver. 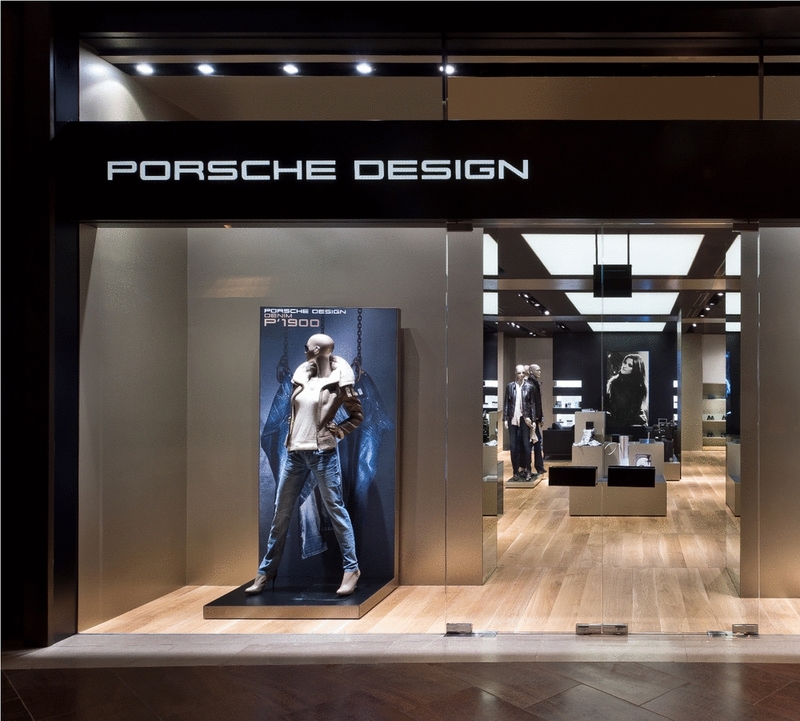 Further plans to expand show Porsche Design's confidence in Canada's luxury retail market. It appears that Porsche Design's presence in Canada could become substantially greater, per capita, than that in the United States. Porsche Design only has 11 American store locations and one outlet location. Within a couple of years, Canada could have as many as 8 Porsche Design stores (though we suspect that number will end up being more like 5). We'll continue to keep you updated on Porsche Design's Canada-wide store expansion. "Calgary", "Chinook Centre", "Edmonton", "Montreal", "Ottawa", "Pacific Centre", "Porsche Design", "Rideau Centre", "Sherway Gardens", "Toronto", "Vancouver", "West Edmonton Mall"
Porsche Design has opened its second Canadian retail store location in Vancouver. A source tells us that the current location is only a temporary one, as there is a free standing store scheduled to open below the new Nordstrom in Vancouver's Pacific Centre toward the latter part of 2015. The current, temporary Porsche Design store is located on the basement level of Hudson's Bay, adjacent to TopShop/TopMan. A source tells us that in early 2014, Porsche Design will relocate to a dedicated space within the Hudson's Bay store for a period of about 1.5 years, until its store below Nordstrom is completed. This permanent location will be in a 48,000 square foot expansion of Pacific Centre. For those unfamiliar, Porsche Design retails high quality, high-priced clothing, accessories, luggage, watches and various novelties. The company was founded in Germany in 1972 to compliment the Porsche motorcar business. It concentrates on product design and products are often manufactured for a limited time. Porsche Design has 11 store locations in the United States as well as one outlet mall location. It also boasts store locations worldwide and its products are also carried in various upscale international retailers. Porsche Design's first Canadian store opened at 77 Bloor Street West in Toronto in the summer of 2012. The 1,600 square foot store has been popular with affluent shoppers, according to Retail Insider's Karim Rashwan. For a while, it appeared that Pacific Centre's landlord was having trouble leasing the retail space located under the mall's future Nordstrom store. We've been informed that some retailers have finally signed leases beneath Nordstrom, including, of course, Porsche Design. We'll discuss some of the other new retailers at a later date. "Hudson's Bay", "Pacific Centre", "Porsche Design", "Vancouver"
A source tells us that Vancouver's Pacific Centre is struggling to secure tenants for its new retail space, to be located directly below Nordstrom. The 48,000 square feet of new retail will be accessed from the mall as well as by an escalator descending from Robson Street. Our source says that Pacific Centre's landlord, Cadillac Fairview, only wants "individual brands" as tenants, rather than national retailers. Some brands have shown interest but have yet to sign leases. We're waiting to hear who will sign, and what stores will follow. This may eventually prove to be a good idea on the part of the landlord. Securing individual brands, rather than retailers available elsewhere, may help differentiate Pacific Centre's new retail. It appears, however, that retailers may be holding back on signing leases for the new spaces. This may partly be due to the retail being located in the basement of the mall, even though it's located below Nordstrom with Robson Street access. There might also be a "wait and see" situation emerging, where retailers are waiting to see who bites first for the basement retail space. We think being below Vancouver's flagship Nordstrom store is a good thing, especially with escalator access to Robson Street. We've heard the names of a few brands interested including AllSaints, and we'll update you on who's moving downstairs. "Cadillac Fairview", "Pacific Centre", "Vancouver"
Today the exterior of Vancouver's former Downtown Sears store will start to be dismantled for the renovation and arrival of Nordstrom, as we previously reported, as well as for offices above. The building's exterior panelling will be removed using an electric crane on a swing stage. This is similar to a window cleaning stage (they say), which will lower to panels to the street level for removal. Panel removal starts with the TD plaza area and then moves clockwise, meaning panel removal will subsequently happen on the building's Granville Street side, then Robson street, then the Howe Street side. 'Built Form' of Vancouver Skyscraper Forum provided this photograph, above, of the ground floor demolition of the interior of the former Sears space. Thank you to 'officedweller' of Vancouver Skyscraper Forum for providing us with the update on the Pacific Centre Nordstrom project. "Nordstrom", "Pacific Centre", "Sears", "Vancouver"
Vancouver BC's new Nordstrom store is forecasted to be the company's top performing store by 2017. The 230,000 square foot store is forecasted to bring in about $200million+/year in revenues, expected to surpass top-performing Chicago (Michigan Avenue) and Seattle (Downtown) flagship stores. In 2018 its 285,000 square foot Manhattan store will open and is forecasted to sell substantially more than the Vancouver store ($300million+/year). A yet-to-be determined Toronto flagship Nordstrom is also expected to do well, though of course they first have to find a location (likely either at the Toronto Eaton Centre or Oxford Place, as previously reported). Last week we spoke to a Nordstrom executive by telephone from Seattle. This insider (we won't name names) informs us that the chain's top performing stores are 'doing well' but that Nordstrom would like to see revenue increases especially at their larger flagship locations. The Nordstrom insider expressed frustration at the downturn in high-end sales at Nordstrom's San Francisco store, for example, and how sales have decreased at its South Coast Plaza (Costa Mesa, California) store, formerly its top performer. This week we'll provide further insider information on Vancouver's (and other Canadian) Nordstrom stores. This includes some new information on store interiors. "Chicago", "Nordstrom", "Pacific Centre", "Seattle", "Vancouver"
We have received word that Vancouver's Holt Renfrew would like to expand its Vancouver store via annexing space currently occupied by a sports retailer. The sports retailer's lease expires in about a year and Holt's wants more space. The current store is just over 137,000 square feet. An expansion would see the store expand to about 175-180,000 square feet. This means it wouldn't be much smaller than the new Nordstrom store set to open at the other end of Pacific centre Spring 2015. The proposed expansion would include expanded space on the store's 'ground floor' and basement level. A retail insider speculates the main-floor space would at least partly become a large women's shoe floor, as Holt's current shoe floor is small for its high level of sales. The possible basement level expansion may become storage and space for an expanded men's floor and restaurant. We had speculated that this proposed expansion would mean a third-level restaurant could open at Holt's. This may not be the case, as a Holt's insider tells us that the top-floor restaurant didn't open partly because of a lack of proper freight elevator and other potential code infractions. If the expansion happens, hopefully a restaurant would be included on a lower-level. We think Holt's shoe salon should include several dedicated luxury shoe boutiques such as Prada, Gucci, Jimmy Choo and others. Luxury department stores around the world have done the luxury shoe shop-in-store concept with success, including London's Selfridges and Ireland's Brown Thomas stores, both owned by Holt's Weston family. Check out the 21,500 sq ft women's shoe space opened September at Breuninger department store in Stuttgart, Germany. It's got 6 shops including Prada, Prada Rossa, Miu Miu, Gucci, Jimmy Choo and Tod's. This video of the grand opening shows some very interesting ceiling lights, as well. We'd love a shoe floor like this in Canada, as we have nothing yet that compares. "Breuninger", "Holt Renfrew", "Pacific Centre", "Vancouver"
Today Retail Insider visited the new Giorgio Armani Black Label men's shop inside of Harry Rosen at Pacific Centre in Vancouver, BC. Well it's sort of new: it opened early September 2012. It was looking good, but we were a bit confused to see a mixture of the pricy 'Black Label' merchandise with slightly less-expansive 'Armani Collezioni' merchandise in the same boutique. We're also surprised Holt Renfrew didn't score Giorgio Armani Black Label for men. At least Holts would have maintained a dedicated monobranded boutiqe. Holt Renfrew exclusively carries Giorgio Armani Black Label for women in Canada at its Vancouver, Montreal and Toronto (Bloor St) stores. The shop has some nice merchandise, nonetheless. It's worth checking out if you've got a budget for higher-priced menswear. Giorgio Armani Black Label men's clothing is also available at Harry Rosen at 82 Bloor Street West in Toronto. "Giorgio Armani", "Harry Rosen", "Pacific Centre"
We're still surprised that many Canadian malls are out-performing American malls' sales per square foot. Vancouver BC's Pacific Centre recently pulled ahead of Las Vegas' Caesar's Palace as the most productive shopping centre in North America (excluding Pacific Centre's 636,000 square foot Sears store that is closing October 7 2012). All prices are in Canadian Dollars (which at press time is comparable to the American Dollar). These quotes are 2012 estimates from KPMG. KPMG puts Pacific Centre's 2012 per square foot analysis at $1580/square foot. Las Vegas' Caesar's Palace comes in at about $1470/square foot. That's 6 American malls and 9 Canadian malls. We note that Pacific Centre's Apple store pulls in over $70 million/year at just 5366 square feet. We're thinking Apple stores might also prop sales at some of these other shopping centres. We were at a bit of a loss as to why Canadian malls were higher. Then we found this excellent analysis by David Fitzpatrick of REUrbanist: http://reurbanist.com/2012/08/growth-in-canadian-mall-sales-performance. This guy knows his stuff. We recommend reading his article if you're interested in examining how currencies and other factors may contribute to Canada vs. USA mall performance. Our favorite quote from David's article? "Bloomingdales", "Caesar's Palace", "Canada", "Chinook Centre", "Las Vegas", "Nordstrom", "Pacific Centre", "REUrbanist", "Rideau Centre", "Sherway Gardens", "Toronto Eaton Centre", "United States", "Vancouver", "Yorkdale Shopping Centre"
Retail Insider received a rendering of the proposed reconstruction of Vancouver's Pacific Centre Sears store. The proposal includes four (possibly five) levels of retail space and four levels of office space. No office tenants have been confirmed, though one broker speculates one office tenant could be the Canadian headquarters for Nordstrom. Nordstrom will take 225,000-230,000 square feet of the proposed 300,000+ square feet of retail space (basement plus three levels above ground), while the top four floors will include 290,000 square feet of office space. The new retail space's configuration has not been finalized as of press time, but you can expect the basement to be devoted to multiple retailers. Nordstrom will be above, while Nordstrom's prime accessory/cosmetic/shoe spaces will be on the ground floor. Cadillac Fairview, Pacific Centre's landlord, is looking to expand the mall with more lucrative retail space on the lower level of the current Sears space. It expects Nordstrom will bring hoards of new shoppers to the mall, which is already the second most productive per square foot in North America (after the Forum Shops at Caesar's in Las Vegas). "Canada", "Cartier", "Chanel", "Dolce and Gabbana", "Nordstrom", "Pacific Centre", "Prada", "Vancouver"
4. Sherway Gardens in Toronto, Ontario - ~140,000 square feet. The first three locations are currently occupied by Sears stores, while the Sherway Gardens store will be a new-build Nordstrom location, corresponding with an expansion of the shopping centre. The 225,000 sq ft Sears store at Sherway will continue to operate. Nordstrom's board of directors is expected to approve these leases by early next week, while a formal announcement could take up to two months. Negotiations are still underway for Nordstrom to occupy part of the current Sears store at the Toronto Eaton Centre. Talks are also underway for Nordstrom to take over the current Sears location at Toronto's Yorkdale Shopping Centre. A previous attempt at building a 165,000 sq ft Nordstrom at the East side of Yorkdale fell through, so talks to take Yorkdale's Sears is still proposed. Yorkdale's Sears store is 190,000 square feet. Given the size of these locations, it is expected that at least the Vancouver store will include such amenities as restaurants, spas, and the luxury women's department called 'Collectors' (carrying such designers as Valentino, Gucci, Yves Saint Laurent, Prada, Lanvin, Missoni, etc). The new Sherway Gardens store is expected to include a smaller Collector's department, which will compete directly with a future-expanded Holt Renfrew store in the same mall. At press time, Bloomingdale's is still negotiating with The Hudson's Bay Company to open concessions within several Bay stores, including a full-line Bloomingdale's store at 44 Bloor Street East in Toronto, Ontario. More info to follow. Stay tuned! "Bloomingdales", "Calgary", "Canada", "Chinook Centre", "Hudson's Bay Company", "Nordstrom", "Ottawa", "Pacific Centre", "Rideau Centre", "Sherway Gardens", "Toronto Eaton Centre", "Toronto", "Vancouver"
Nordstrom management has just confirmed that it is still interested in coming to Canada, but it is struggling with Canadian law relating to their bringing-in full-time American management to run Canadian operations. A Nordstrom insider confirms that this is a challenge, despite their being interested in three Cadillac-Fairview owned Sears locations: Pacific Centre in Vancouver, BC, Chinook Centre in Calgary, Alberta, and the Rideau Centre in Ottawa, Ontario. A Toronto location is speculated to be in a suburban mall, either Yorkdale Mall or Sherway Gardens. Lease negotiations continue, but the company is currently grappling with how it will bring Americans to run Canadian operations. Lease negotiations for a Toronto Eaton Centre store recently stalled, much to the dismay of Toronto commercial leasing insiders. Efforts will continue to secure leases for a Downtown Toronto Store, as well as one or two suburban locations. Nordstrom is currently seeking approximately 220,000 square feet in Vancouver and about 150,000 square feet in both Ottawa and Calgary. If Nordstrom succeeds in securing Canadian locations, Canadian headquarters would likely be located in Vancouver, BC. We will provide more information and developments as they come available. "Calgary", "Canada", "Chinook Centre", "Nordstrom", "Ottawa", "Pacific Centre", "Rideau Centre", "Sherway Gardens", "Toronto", "Vancouver", "Yorkdale Shopping Centre"